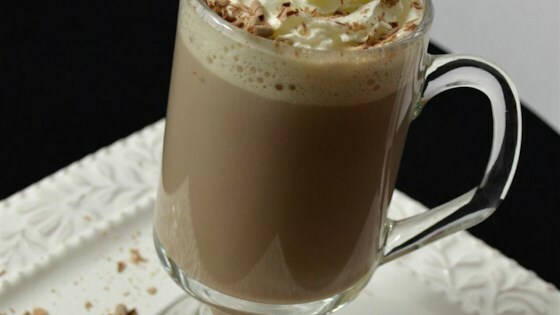 "A mixture of instant flavored coffee and instant hot cocoa that looks and tastes like it came from a cafe! Top with a dollop of whipped cream and a pinch of cinnamon!" Microwave milk in an microwave-safe glass or bowl until almost boiling, about 1 minute 45 seconds. Stir coffee mix, sugar, and chocolate mix together in a mug. Pour hot milk over coffee mixture and stir until mixture is dissolved. This was pretty good for a quick warmer-upper and very easy to make. My only substitution was using Splenda in place of sugar.